Who can view your site? WordPress offers good broad options for allowing, or restricting access to your site. 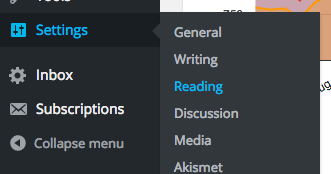 Look in the Settings > Reading section of your dashboard, where you’ll find a range of settings title Site Visibility to allow you to control access to your site. The options really go in order from most open (public) to less open, authenticated settings below. Allow search engines – is the fully public, searchable setting that most blogs will want to use. Discourage search engines – simply uses metadata to tell search engines not to index a site. Not all search engines obey these directives, and your site is still public. Must log in – anyone can view if they’re logged in. As our wordpress service is linked to the central authentication, this effectively means all staff and students. Registered users – not only must a user log in, but they also have to be a registered user of the site. As a site admin, you can manage this yourself. Admin only – all sites start out this way. Only administrators of your site can see it. This gives you a chance to get your site started before releasing it to the public. Custom password – you can set a single, custom password for your site. Not really recommended because it can get tricky to manage. These settings apply to a whole site, they don’t apply to individual pages or sections. Options for that finer level of protection are limited, and if this is important to your site, then we would not recommend the wordpress platform.